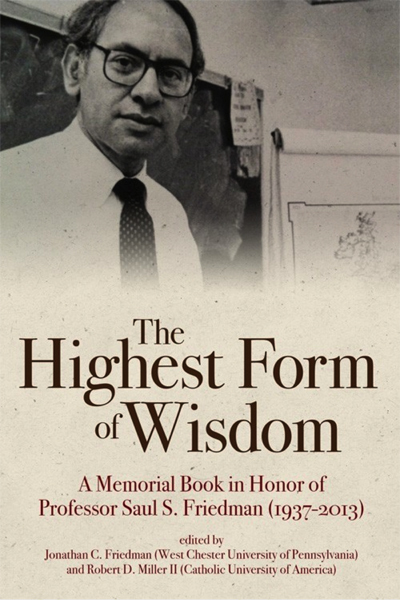 “The Highest Form of Wisdom,” a book of scholarship by internationally known academicians in the fields of Jewish and Holocaust history, has been published in memory of Saul S. Friedman, who served as professor of Jewish history at Youngstown State University and was one of the architects of Holocaust and Genocide education in the United States. Twelve scholars from across the globe participated in the project and cover the expanse of Jewish history from ancient to modern, with a particular emphasis on the Holocaust. Among the contributors are Robert D. Miller of Catholic University of America, Rafael Frankel of Haifa University, Rafael Medoff of The David Wyman Institute for Holocaust Studies, Helene Sinnreich of YSU, Steven Jacobs of the University of Alabama and Gershon Greenberg of American University. Friedman, who died in 2013, earned a Ph.D. in history from Ohio State University in 1969, and that year he began what would become a 40-year tenure as a professor in the history department at YSU. He was a popular teacher and prodigious scholar, publishing a dozen books. In the late 1980s, he turned to documentary filmmaking; five of the films won regional Emmy Awards. Friedman was an advocate on behalf of the Jewish community and a leader in the Zionist Organization of America. He served as a trustee for the Lillian Schermer Charitable Foundation and was instrumental in the dedication of a Holocaust memorial at the Youngstown Jewish Community Center. He received six distinguished professorships and the Ohio Humanities Council’s Richard Bjornson Lifetime Achievement Award for Service to the Humanities. In 2000, he received an endowment from the Clayman Family of Youngstown to establish a Jewish Studies program at YSU.